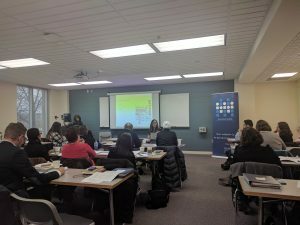 On March 23-24 of 2017, the Auschwitz Institute for Peace and Reconciliation (AIPR) held a pilot version of a new initiative to provide support to NGOs working on behalf of the Muslim, Latino/a, Native American, African American, LGBTIQ+, immigrant, and other marginalized communities in the United States. The event, organized in collaboration with the Cardozo Law Institute in Holocaust and Human Rights and hosted by Metropolitan University in St. Paul, Minnesota, looked to assist those working on behalf of these communities in better responding to the current social and political climate marked by a multiplication of hate crimes and the growing use of hate speech within mainstream media and communication. More than 20 participants attended the two-day event, representing a diverse array of organizations. The curriculum presented within the two-day training built upon an understanding of the development of atrocity processes and included an exploration of the tools offered by a human rights approach and by the international human rights system for the prevention of identity-based crimes. Following opening remarks from representatives of AIPR, Cardozo Law, and Metropolitan State University, Dr. James Waller delivered an introductory module to the concepts of genocide, atrocity Crimes, and their prevention. This was followed by group discussion and a subsequent module on the topic of social identity. Professor Jocelyn Getgen Kestenbaum of the Cardozo Law Institute in Holocaust and Human Rights then delivered a presentation on existing human rights frameworks and how they can be employed in advocacy efforts in the United States. 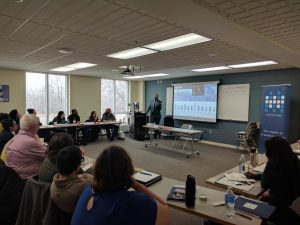 The second day of the event was comprised of presentations by Dr. Ellen J. Kennedy, Executive Director of World Without Genocide, Jaylani Hussein, Executive Director of the Council on American Islamic Relations’ Minnesota chapter, and Dr. Kerry Whigham, AIPR’s Academic Programs Officer for Online Education. This was followed by a session devoted to group discussion on potential avenues for building networks and informal coalitions to enhance the work being done by the participants of the training.